We’re becoming a nation of wussies. The freezing wind and mounting snow of the East Coast “Blizzard of 2010” raged. Travellers attempting to return home after the Christmas holiday were stranded in airports, rail stations, buses, and cars. Patience ran short, tempers flared, some ranted against Mother Nature, others slowly resigned themselves to their Fate. 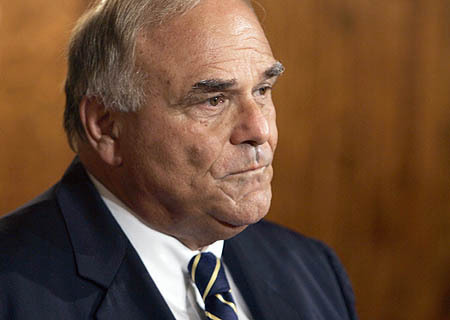 The Pennsylvania governor, Ed Rendell, however, raged against the decision to cancel the Vikings/Eagles football game and seized that occasion, among the many 2010 offered, to deride his fellow Americans as “wussies.” Nothing stops a football game, in Rendell’s view, and that includes a blizzard that brought several states to cry “Emergency!” The Chinese, argued Rendell, would have walked to the game regardless of the weather - while solving calculus problems on the way. The Game would go on. The Game needs to go on. Whatever “The Game” means on the deepest primordial or collective level, that place which has been touched, like a nerve in a root canal probe, and electrified Rendell - and how many others? - it is surely and must be more than what it appears to be - two teams in heavy gear clash over the possession of a leather ball, each attempting to fulfill their mission of bringing that ball across their opponent’s goal line more times than can be reciprocated by the opponent. So it’s combat, or, in respect to those in Afghanistan, Iraq and Pakistan, in real combat with mortal consequences, it’s a mock-combat. The potency of this surrogate combat most likely increases when the U.S. is actually engaged in war, especially perhaps when those wars are frustrating in a variety of ways, all arguable. Like Vietnam, one of the frustrations in our Middle Eastern wars, has to do with “war” itself. Combat was then jungle warfare with an invisible enemy, and now like a police operation in an urban warfare zone, or the Calvary’s pursuit of the wily Apache into an unreachable Cochise stronghold. The enemy is elusive, untrained in conventional warfare, a bricoleur of deadly contraptions that fly under the radar of our “smart” weaponry, an antagonist who won’t play on our game board. Box cutters, shoe and underwear bombs, improvised explosive devices, - all these play havoc with our notion of how the game is to be played. And most unsettling, frustrating and always deadly are the suicidal assaults launched against any and all, civilians as well as combatants. “Winning” is problematized not only because our goals here are ambiguous and changing, but because our opponents have taken “Winning” off the field and into the Afterlife. We play on the field of mortality, not immortality. If this is “The Game,” we curse it. We fulminate against it and the longer it goes on the more enraged we get. But we don’t. In the 2010 Congressional elections, anyone’s position on Afghanistan didn’t reach anyone’s interest. We take our frustrations out in all manner of distractions and seductions, from Facebook, where we personally rule The Game of Life to football, where both sides know and follow the rules of warfare and have the same notions of what winning and losing are. The more intense our suppressed negatives regarding real war, the more intense our attachment to these manifest sublimations. The swirling assault of this “Blizzard of 2010” becomes the face of our antagonist, the blizzard, an attack. And this attack we will meet head on and annihilate, exactly what we have not been able to do in any clear fashion anywhere in the Middle East. Calling off a game of football now is like a withdrawal in defeat and the U.S., still in the grip of the Great Recession, is in no mood to see itself on its knees. In these days of continued unemployment of so many, of continued foreclosures of so many, of increased poverty, “The Game” may mean the game Wall Street has played and continues to play. Like football, you could say that Wall Street “players” play a deadly game that offers them a sort of testosterone, cathartic-release opportunity. And a whole lot of money for services hard to define. “Winning” here is represented in stock options and phenomenal bonuses and what George Carlin would call “stuff,” lots of stuff. This Game is now globalized and while that has enabled the financial finaglers to “take the money and run,” including taxpayer money, there is a seething, dark anger with no release valve festering in the American Everyman. All the psychic circuitry here lies deeper than the football/Afghanistan war psychomachia because there is greater confusion, more red herrings, more personal defense walls established. The Wall Street game has brought many to a desperate state, but there has been no retaliation. The Dodd-Frank financial reform law has been signed, but the new Republican chairman of the House Financial Services Committee believes that “regulators are there to serve the banks.” Because the many who are angered by Wall Street’s assault on their well-being also believe that government, including its regulators, should bend to the will of “market forces,” their anger has no target that can afford any release. This is an accurate description of the course of bamboozlement, perplexity, ensuing anger, and frustration. The Game then comes off the psychic bench and the substitute is football. On this field, with these adversaries, with these rules of play, with all the certainty of what victory is and what defeat is, The Game must not be called off. The “Blizzard of 2010” is not in any way any sort of reason that we are prepared to accept. Governor Ed Rendell’s anger had far deeper wellsprings than a football game between Eagles and Vikings.